1. Need fresh pass out interns or experienced dentists to work in a Dental Clinic in R T Nagar, you will gain experience and can do independent procedures..
contact 8904814124 Candidates preferred from nearby areas only..
GITAM DENTAL COLLEGE, ANDHRA PRADESH INVITES APPLICATION FOR THE POST OF PROFESSOR AND READER IN ALL BRANCHES. JUNIOR DENTIST WANTED FOR A PRIVATE CLINIC IN BRIGADE ROAD BANGALORE , SALARY AS PER SKILLS AND EXPERIENCE. NEGOTIABLE. 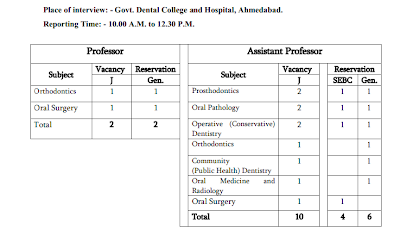 Applications are invited for the post of assistant professor in Government Dental College, Ahmedabad. Required a freshly graduated BDS for a successfully running clinic in haryana. Aligarh muslim university, invites applications for the post of Assistant Professor in Department of Orthodontics and dental anatomy. Full fledge dental clinic on sale including chair, xray , autoclave etc ..
Take over will be preferred good patients number..
1. Required a competent dentist (BDS) for a reputed hospital in South Delhi..
3. Required BDS Dentist (Full time 9am-1pm 5pm-9pm with around 1yr experience) for a clinic in south delhi prefabourably staying in south delhi. 4. BDS 0-2 Yrs exp. wanted for Dentessence Dental,Noida, Close to Metro Station. A Great opportunity to earn as well as Learn... the candidate should have good communication skills. Preferably residing in NOIDA. Mail your resume with Photo to smile@Dentessence.com . Sree Jayam Dental Clinic is well established dental chain clinic at Nanganallur, Chennai, India. We are looking for a consultant dentist to run our branch clinic located at Nanganallur, Chennai, India. The job requires full time association, independently handling the branch clinic and extending quality service. Dental surgeons in and around nanganallur are preferred.